Los Angeles in Southern California is a city like no other. A city that is famous throughout the world for being the center of all things film related. Whether its the famous Hollywood sign or the L.A. Lakers there is more to do in this city than you could possibly fit into a few days. With a population of 4 million people, each neighborhood offers something different to explore and discover. With so many things to do in this great city I had to leave some out, but let’s take a look at the best things to do in LA. Universal Studios is famous throughout the world, attracting millions of visitors each year. You can go behind the scenes on a movie that is being produced at the time. There are rides taken from actual movies such as Minions or Fast and Furious, the rides are guaranteed to make you feel like you are in the movie. Kids and grownups will love this place and it is an absolute must for any tourists to Los Angeles. For those that love to meet their film heroes you can visit the Transformers or Simpsons for countless photo opportunities. Disneyland Resort is so big that you could have a whole article just on the things to do in this park. Fitting it into one day is not feasible so make sure that you plan for at least a couple of days. Instead of just one Theme Park there are two, the 12 acre Cars Land and of course the original Disney California Adventure Park. Whilst at the resort you can explore the many rides and attractions that are on offer. Why not fly across California on a magic carpet or travel under the sea with Ariel the mermaid. Griffith Park spans over 4,210 acres of landscaped parkland and untouched terrain. The park itself is the largest municipal park that has a wilderness area in the United States. For those who want to do more than explore the many acres of land, or walk the 53 miles of hiking trails, a trip to the observatory is a must. Here you can looked through the world’s most famous telescope and observe the stars above us. Other activities in the park include camping, swimming, golf, pony rides and much more. The Hollywood Walk of Fame is such an attraction that every year, approximately 24 ceremonies are broadcast to keen viewers around the world. In these ceremonies the latest addition to the walk has their star placed into the pavement. It is completely free to come and see the walk and if you are lucky you will even get to see a new star being installed. It is however not free for the sponsor of the latest nominee, on approval of their place on the walk a fee of $30,000 is payable to the Hollywood Historic Trust. The Getty Center is home to the J. Paul Getty Trust. The trust is the largest philanthropic and cultural organization dedicated to art in the world. There is a permanent collection of painting to view at the Center including many pre-20th century pieces. If you like sculptures there are four pavilions full up with them, divided up by their era and the nationality of the artist. Ever since 1927 the TCL Chinese Theater has been the home of the world’s most important red carpet moments. This is the place where you can see the Hollywood stars coming to enjoy their movies. At the front of the theater you will see the ‘forecourt of the stars’ a place that has cement hand and footprints of many famous movie stars, both from today and bygone era’s. The cinema features the largest IMAX in the world, which also includes a laser projection experience making the movies you go to watch more than just another night out. The Hollywood Sign is the most iconic sign that there is in the world today. The sign itself was designed and built for a real estate project that was happening in the area. The development was called Hollywoodland. The idea behind the sign was that Hollywood was a place where magic was possible and dreams could come true. 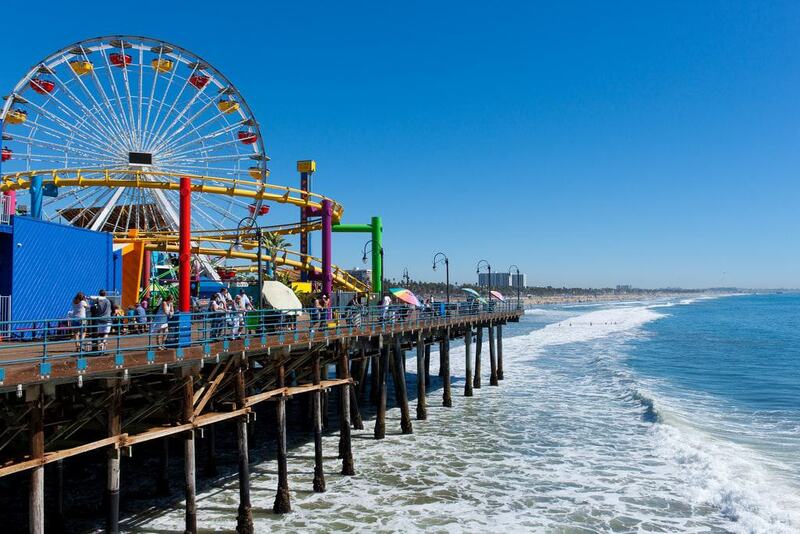 Santa Monica Pier was created in 1909. The area was faced with a problem in regards to their sewage. The city was creating all this mess but there was nowhere to put it. The 1,600 foot pier was created with a pipeline running underneath it. The pipeline would go right out into the sea and the sewage would float off into the vast oceans. Luckily in 1920 this practice stopped for good. The pier is made of concrete so stood to up to all the weathering that the sea could throw at it. As the years went by the pier started to be used for things such as fishing, until it developed into the pier you see today. The Walt Disney Concert Hall is where the Los Angeles Philharmonic orchestra call home. The building itself was designed by renowned architect Frank Gehry. The hall is said to have some of the best acoustics in the world and people flock here from all over to hear the music that is played. The building is full of stainless steel curves and the auditorium is made from hardwood paneling. The complex covers 3.6 acres and completely embodies the spirit of Los Angeles. Right in the heart of the Los Angeles are the La Brea Tar Pits. They are one of the most famous fossil localities in the world. The museum displays many varieties of fossil from the Ice Age, including mammoths and sabre-toothed cats. As time goes by natural asphalt seeps up through the soil here, and it is this asphalt that is covering the animals hidden below. This is where the fossils are excavated from and then put into the museum itself. The Hollywood Bowl is more than just somewhere to listen to some live music. It happens to be the largest outdoor amphitheater in the United States as well as the home of the Hollywood Bowl Orchestra. Unlike most venues, this one offers you an unusual freedom. You can bring your own food instead of being forced to purchase the food that is on sale there. Maybe the best thing about this place is that on most nights the seats at the back start from just $1 making the bowl accessible for all sizes of wallet. You would have heard of the L.A Lakers if you have any knowledge at all of basketball. They are one of the most successful teams of all time, having won the NBA Championships 16 times. Currently they are the most valuable franchise in the NBA with an estimated worth of $2.6 billion. This is more than just a team, they are an institution and a trip to Los Angeles cannot be complete without watching a game. The Staple Center is also home to the Los Angeles Clippers, Sparks and the Kings Hockey team. Whenever you arrive there is sure to be something to watch at this epic arena. You may have noticed by now that this part of the world does not do things by halves. Los Angeles Zoo is no exception. Owned by the city, the zoo is home to more than 1,100 mammals, amphibians, birds and reptiles. There are no less than 29 different endangered species within the zoo as well. Every year 1.5 million people walk through the gates of the zoo and wander around the 133 acres to marvel at all that is on offer. There are various exhibitions at the zoo with the latest one being the ‘Rainforest of the Americas’. In this exhibition you will feel like you are in a real rainforest as you trek between the trees and admire the spectacular wildlife. Dolby is a household name the world over, it is a name synonymous with quality. The Dolby Theater is no different. One of the premier entertainment venues in the world, many famous artists have sung to sell-out crowds, including the likes of Celine Dion, Stevie Wonder and Prince. The Theater is split over five levels and has one of the largest stages in the United States. The Dolby Theater is within the Hollywood and Highland, an area of 640,000 square feet that features some amazing nightclubs, restaurants, shops and cinema’s. 15. Get Arty At The Museum Of Contemporary Art. The Museum of Contemporary Art is so big that it actually covers three different locations in Los Angeles. The main branch is on Grand Avenue which is in the downtown part of the city. The exhibits are mainly made up of European and American art that has been created in the last seventy five years. There are nearly 6,000 works of art to be viewed across the three locations, many of which come from privates collections. Sitting on the Hollywood Boulevard is a world famous tourist attraction, Madame Tussauds Hollywood. Here you can mingle for as long as you like with your favorite Hollywood movie stars. You can meet everyone here from A-List movie starts to the latest sporting idols. The Madame Tussauds brand has been in existence for over 200 years, so they know what they are doing when it comes to knowing how to keep the customers entertained. If you are looking for somewhere to hang out and relax in the evening, Universal CityWalk is a great place to start. Home to more than 25 restaurants, 30 shops, 6 nightclubs, a movie theater with 19 different screens and an outdoor concert venue. Universal Citywalk is the perfect place to take even the most demanding of partners as there is too much to do to ever be bored. The walk is open every day of the week and if you time it right you can see live street entertainers for free to add to the Hollywood feel this area gives off. At the eastern end of the Santa Monica Mountains is Runyon Canyon Park. A 160 acre piece of land that is ready for exploring. Over 50% of the park operates a no leash policy for dogs, giving you and your pet the freedom to roam the trails and empty spaces freely. The Santa Monica Mountains Conservancy purchased the park in 1984 so as the city and its people had another park to explore and enjoy. If you like hiking there are three different trails to hike, each with a different level of difficulty. The Natural History Museum of Los Angeles County is a huge museum, the largest in the Western United States. Within its walls sit approximately 35 million artifacts, covering in the region of 4.5 billion years’ worth of history. The museum has recently celebrated its 100th anniversary and is more popular now than at any point before. The museum is split over three levels and has a section devoted to dinosaurs which is always incredibly popular. The people of Los Angeles love going out of an evening and having a great time. L.A. Live is another of the city’s famous night hot spots. Here you can take your choice of activities from one of six live entertainment spots, a cinema with fourteen different screens, the GRAMMY museum or twenty different restaurants. For those looking to remain close to the action there is also a 54-story hotel. Another of the great American sports is Baseball. The Dodger Stadium is home to the Los Angeles Dodgers, a Major League Baseball team. This stadium is worth a visit as it is the biggest baseball stadium in the U.S. The stadium has been in existence since 1962 and is the third oldest baseball stadium in the country. The team has yet to hit the dizzying heights of the LA Lakers have in basketball but an afternoon spent in the park is time well spent. No trip is complete without a visit to the beach! Santa Monica State Beach is an iconic beach that attracts visitors from across the globe. There are 245 acres of sand on the beach, incredible waves, and bike and foot trails. The beach is near the Santa Monica Mountains giving you a beautiful backdrop on which to sunbathe. If you are interested in surfing lessons you can pick these up from down on the sand. 23. Increase Your Knowledge At the GRAMMY Museum. The GRAMMY Museum is more than just a museum, it is also a venue where people can go to see some of the world’s most popular artists. The museum itself is a living history to everyone that has won a Grammy Award in the past. The mission of the museum is to educate the visitor in different musical genres as well as their history. Among the artifacts on sale here are hand-written lyrics, awards and records. Sitting in the middle of Barnsdale Art Park is Hollyhock House. The house was originally designed and built as the residence for an oil heiress called Aline Barnsdale. Now the property is owned by the city and attracts many visitors each year for a grand tour. The property has undergone extensive renovations over the years, the most recent of which was in January 2015. When the property was reopened to the public people queued for hours to get a glimpse inside. It is not just in life that the rich and famous get to live out an exclusive existence. In death they can as well at the Hollywood Forever Cemetery. This is one of the oldest and most extraordinary cemeteries in Los Angeles. The history of the cemetery is as colorful as the people that are buried here. At one point Hattie McDaniel, best known as Mommy in Gone With The Wind wanted to be buried here but the owner at the time refused. The cemetery has appeared in several movies and is well worth a visit when you are next in town.